When people in the green industry need great plant material, Oregon is usually one of the very first places they look. The sales numbers show exactly why Oregon is called “Nursery Country.” According to the USDA Census of Agriculture (2014), Oregon is number one in deciduous shade trees, deciduous flowering trees, coniferous evergreens, bare-root nursery products and B&B nursery products, as well as Christmas trees. The state is third in overall horticultural products sold, as well as broadleaf evergreens, deciduous shrubs and containerized nursery products. 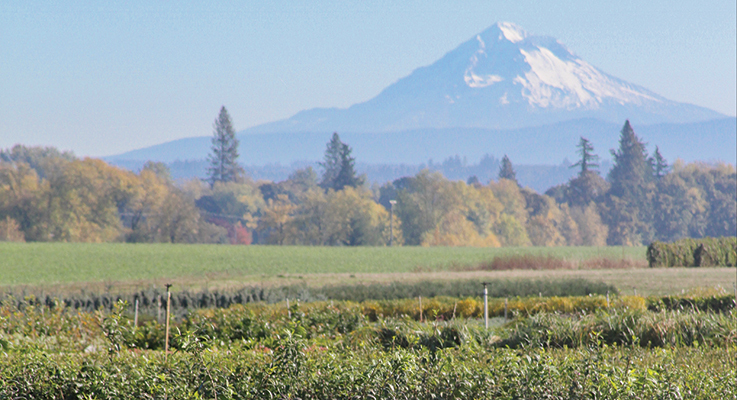 And no state has more land in nursery production than Oregon’s 61,099 acres. Knowing all that, it’s not surprising that horticulture is consistently one of Oregon’s top two agricultural commodities (along with beef cattle). Most of what Oregon produces — an estimated 75 percent, in fact, by gate value — is shipped to markets out of state. That brings jobs to Oregon. According to the Oregon Department of Employment, Oregon has more than 9,000 jobs in nursery and floriculture, with a payroll exceeding $265 million and an average wage of $29,003. Why is this? Why is Oregon such a powerhouse of horticultural production? An ideal climate, with winter dormancy and a long growing season. Rich, fertile Willamette Valley topsoil. Adequate water supplies, with growers committed to efficient use. These are the factors consistently mentioned in any discussion of Oregon’s strength in the nursery marketplace. But there’s one more. On the following pages, you’ll get the chance to meet some of the resourceful and hard-working growers of Oregon Nursery Country, who produce a wide variety of material, from annuals to perennials to trees to shrubs. You’ll hear straight from the horse why they’ve made lifelong commitments to excellent plant quality and strong customer relationships. We hope you enjoy this journey through Nursery Country. Want to see for yourself? We encourage you to tour the nurseries this summer as part of your trip to the Farwest Show, August 23–25 in Portland (www.farwestshow.com). Need material for spring? You can search for more than 5,000 different plants grown by 498 different growers on www.NurseryGuide.com. If you get stuck, you can call us at 503-682-5089 and we’ll help you find what you need.